Owning Sky: Alot of guilds raid Sky. Few guilds have made it through to the end. Fewer still have the resources to farm Island 8 getting mage crowns for a large number of guild mages. The Syndicate launched a ONE day raid and attacked Sky and cleared it. They left the day off by camping a raid force on Island 8. Due to the selfless nature of a group of Syndies, we were able clear island 8 repeatedly until we had mage crowns banked away for every mage in the guild. This was significant since the raid took 1 day when typical raids take 3-4. And since it made it through to the end of Sky when most get stuck at Island 6 and unable to clear the bees on Island 7. Special congrats go out to Pregken, Zabben, Nariel, Everia and Dakai for their critical contributions to the success of the crown hunts. Owning Inny: Innoruuk is the god of the Plane of Hate. He is a hard mob and was made even harder by Verant in the middle of 2001. 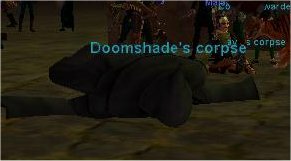 Since that time only a very small number of guilds were able to engage and kill him. 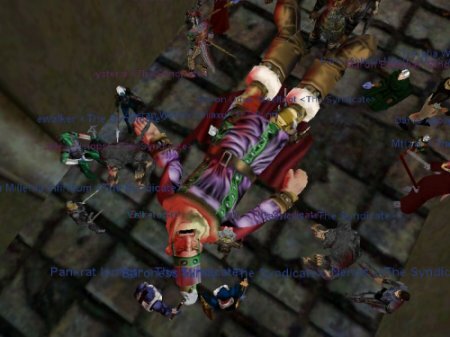 You could count the number on 1 hand out of the several hundred Tarew Marr guilds. In late 2001 The Syndicate decided it was time to clobber him repeatedly for fun. Going up to Hate, they formed up outside his lair. Inny had no idea what was coming when the attackers swarmed in. 1 group was tasked with dealing with the imp trap and keeping it from going off again and with dealing with adds. A "click res" station was setup for the fallen members. And the rest worked in unison to melee, heal, slow and nuke. Soon inny was a corpse although several Syndies had fallen as well. He dropped his usual nice collection of loot. Since then The Syndicate took up the challenge to kill him over and over. Poor Gore: The Syndicate juggernaut continued to grow in strength and size. Members worked better and better as a team and more turned 60 every day. The next stop on the hitlist was Gore, the dreaded white dragon in the Dreadlands. Gore complete heals, fears and is generally just nasty. The Syndicate was undeterred. Lining up at the old ice lake with casters on the hillside and melee on the lake, she was pulled into camp. Gore let out a roar but nary a person fled in fear. Onward they battled with enchaters draining mana and nukers opening fire with clerics dodging in and out to heal the melee. In the end Gore was died. The Syndicate went on to farm Gore many more times both for her epic pieces as well as spells and other loot. 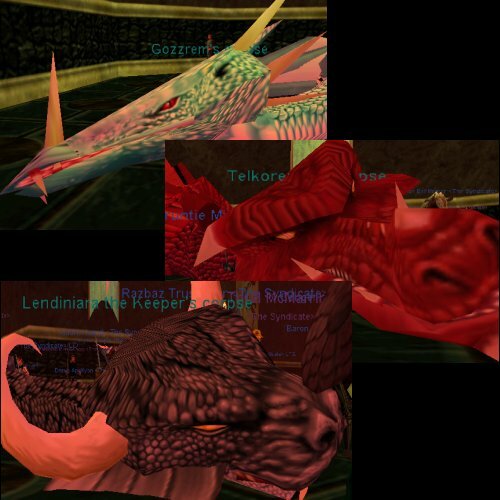 Other Dragons Follow: Once Gore died, many other dragons began to be engaged and taken down. Gore, since she heals, is considered one of the harder ones. Sevilrous was engaged and destroyed with 2 deaths. The MA tank only needed 1 heal. The Skyfire dragon was also engaged and obliterated. The Syndicate warmachine marched forward mowing down dragon after dragon. Farming the Western Wastes, where dragons roam all over, was done on several occasions with hoardes of dragons falling before our might. When a dragon see's us coming, its time to get out of the way. Trak Meets His Match: We then embarked on a project to obtain keys to Veeshans Peak. To do that you need to kill Trak. 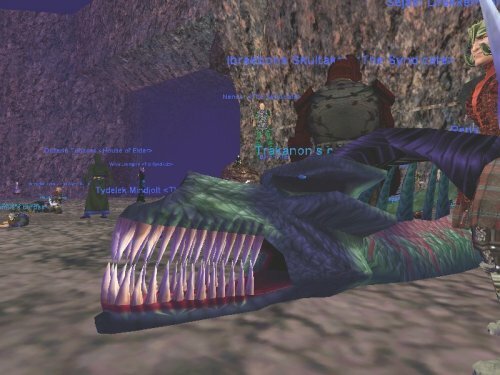 Trak is a poison based dragon in Sebilis. He has a nasty DOT (damage over time) spell that is the bane of many raids. In order to farm Veeshans Peak we needed many of his teeth so he needed to die many times. Time and again, Syndicate might marched into Trak's lair. Time and again Trak fell to their might. His teeth were harvested and Veeshans Peak keys obtained. There was no end to the swath of destruction Syndicate armies cut through the monsters ranks. 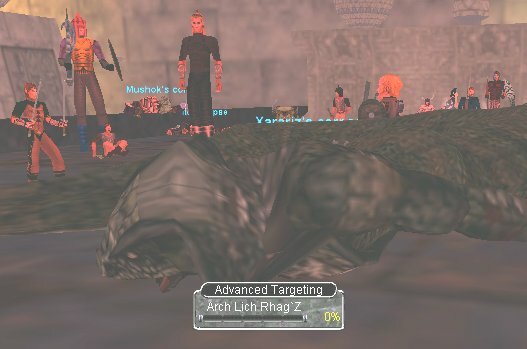 Vindicator Dies: Vindicator was long a measure of uberness of a guild. He quad hits for 700 damange and can flurry attack. He has 200,000 hitpoints and 2 linked guards. Taking him down is something a very very few guilds have done. So our eyes turned to him as our next challenge. Gathering inside the Kael arena, the Syndicate army waited patiently as the puller split the guards. Both guards fell in seconds. Would this be that hard? Then Vindicator was pulled and soon he was among the army swinging his mighty arms up and down bashing melee with devastating damage. To his dismay, Syndicate clerics had worked out a pattern of healing to keep them alive and although he tried to push through the crowd to reach them, the melee held him back. Working as a team it wasnt long before Vindicator lay dead. The current bar for uberdom was crossed. Now a new bar was set and a new challenge to be met. On a lighter note, during one CR the safe cleric got aggro and died. 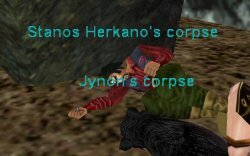 As a result we had to fight back in to our corpses. Thus was born the "santa brigade". In summoned (red) armor with summoned weapons, a very rapid CR fight took place and soon all members were ressed. Here is a picture of the Santa brigade in action. 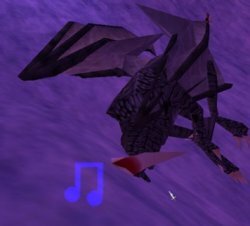 A New Mob Emerges: In Feb of 2002, Verant updated the high level zone called the Umbral Plains. Already a fun and challenging high level exp zone, they added a new uber mob called Zelnithak. Zel is a very large camel with an insane amount of hitpoints. 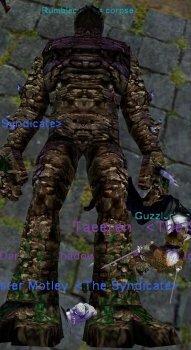 He has an AE knockpack and hits for 400+ Size wise he is very large dwarfing the larger races. 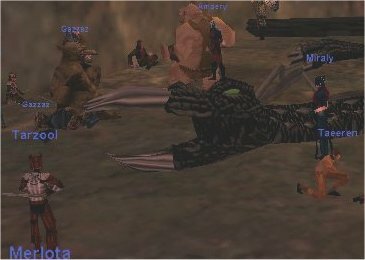 The Syndicate was the first guild, on any server, to find him and kill him. 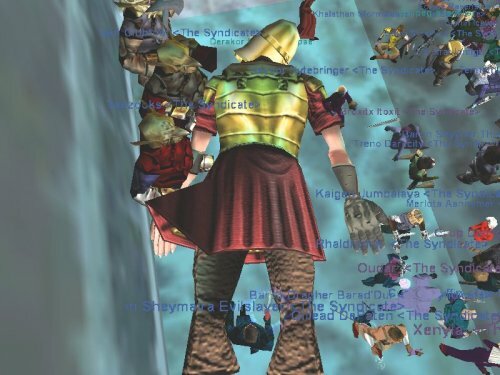 While he didnt pose a serious challenge to us due to our ability to file more than 125 members over level 55 and more than 200 over level 50 if we needed to, he was alot of fun and another mob killed and being the first to do him was also nice. He dropped a nice bracer and a cool mana orb. Velk Dies: Velk has a large icy lair located off the Great Divide in Velious. He is a nasty Giant in that he hits for 850 (more than Vindicator) and is deep in his castle beyond trecherous ice and lots of misc much easier creatures. There are 2 things that make him easier than Vindicator though. First, he has a very slow regen time so if you died you could CR fast enough to get back before he had fully regenned. Second, while he is casting, he doest hit and his spells are weaker than his melee and often resisted. The Syndicate hadnt yet taken him down and wanted to do so just for heck of it so we went to his lair with a solid team of members. When we engaged him the first time he was somehow bugged and literally popped in and out around his lair. In the walls, up high, all over. It wasnt "ping pong" but some very weird game phenonmon. He still dropped to 10-15% before we died. We CRd slowly learning the best places to do it other than the zone in and reengaged him at full health . This time we moved him to a smaller area and completely decimated him. Rumblecrushed!! : Verant added an expansion pack called Shadows of Luclin loaded with uber mobs to kill. Rumblecrush is a big boss mob of the Umbral Plains zones. Hit rampages, hits very hard and is a nasty mob tougher than Vindicator. The Syndicate was farming other minor boss mobs in the zone when he spawned one day. With under 40 people he was engaged and crushed. Chalk up another one to the Syndicate killing machine. Stanos Takes A Nap!! : Its long been said that Stanos was the hardest mob in the old lands (before they buffed CT and Inny). He is the rogue guildmaster in HHK and drops a head needed for a fancy rogue mask. He summons all the bandits in the zone to come help him and brings some tough friends sometimes as well. 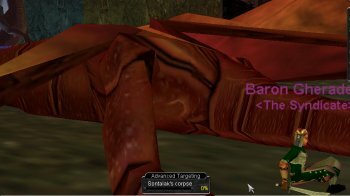 Because there are very few of those masks on the server, and because Stanos is a mob few have killed and often considered difficult, The Syndicate chose to engage him. In the end he died 15 times and several masks were completed. The HatTrick!! : The Syndicate moved from HOT into WTOV expecting it to be a bigger challenge than HoT was. Instead it proved to be quite easy for us and we farmed it heavily for armor for those who still needed it. One day, as we were forming up, we learned that the zone had reset not 5 hours before! And all 3 named dragons in WTOV had spawned. Being the first guild there, we had the jump on them and began to call in reinforcements. Soon the Syndicate army was gathered and we pushed into Gozzs room and quickly dropped him. On to Telks room and he too was owned. Then on to Lends area and despite being trained by another guild 3 times (in an effort to keep us from killing him for the sleepers key) and being told wed likely fail our first try since it took them hours and many CRs, we dominated Lend with fewer losses than in any of the other fights. It was a sweet 3 uber afternoon. Zland!! : Onwards and upwards the Syndicate keeps moving forward to new and different and more challenging mobs. Zland fell to us in our quest for ever more Sleepers keys. UP.. NTOV: Umbral Plains posed another challenge when Doomshade was up. He is fun to trigger and is owned by The Syndicate on repeated occasions. 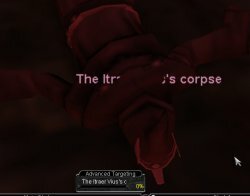 NTOV was our next big push and we began pushing into there killed named mobs as we went. PoM was a fun place to visit.. once.. until they rework it. Sleepers & VP: The Syndicate made a big push for Sleepers Keys and VP keys and began raiding both of those zones. Fun places to raid and a nice change of pace. Since they are places 99% of EQ guilds will never see that made them a bit more exciting and rewarding. CT, God Of Fear: Fear is one of those places that most guilds outgrow by about lvl52 or so. But CT, the god of Fear, is always a fun kill. He drops some nice stuff and if not handled right can be a challenge. Here, he lies dead as he lost control of his domain to The Syndicate. Klandicar: Kland isnt a particularly hard dragon having factored in what we have already done but we havent had much luck catching him up. Finally we did and we began to tear him apart hunting for that Sleepers Tomb key he carries. TiV: TIV is fun. With the wrong tactics he owns raids. But with the right ones he dies and drops very nice loot. ArchLiche: Ssra is heavily contested so we havent focused on it much but one day we saw the Arch Liche was up. We formed up and headed to his lair and wasted him. Was a very fun fight and one we enjoy repeating. 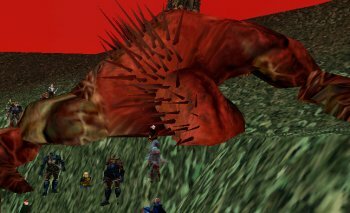 Grummus: Grummus, the boss of PoD, is a fun mob. He has 2 AE DoTs that are deadly and getting him to the right spot without alot of adds is key. It took several CRs but once we figured out the spot, killing him was easy. Terris: Pushing through the POP bosses, we next went into PoNB and took on Terris. She is fun because of the interesting issues you deal with during her fight from the mass AE dispel to the butterflies to the gargoyles. We found her to be well within our power and soon she was dead and we moved on to bigger targets.